Gravity is a subject that sneaks around the senses. It’s all pervasive. It gets everywhere in your life, but on the whole you ignore it, except when it intrudes in the form of a fall. It is, of course, much more than the thing that sticks you to the surface of the planet, as it tends to be presented in children’s non-fiction books. It’s why the Earth stays in orbit. It’s why the Earth and the Sun formed in the first place. And all this from a force that is billions upon billions of times weaker than electromagnetism. 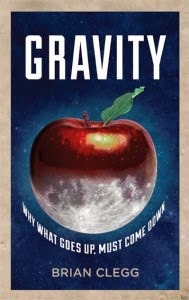 In the same way, gravity tends to be sidelined in popular science books. It creeps into books about relativity, or basic physics. But I’m not aware that it has been treated head on until now. To be honest, when presented with it, I was worried that there wouldn’t be enough material to fill a book, but Brian Clegg has defied that possibility by giving us both a historical journey through humanity’s gradual understanding that gravity existed at all (I love that Newton was criticised because his idea was ‘occult’) up to the amazing breakthrough of general relativity. This is the most detailed explanation of general relativity I’ve seen in a popular science book, which really helped as most of the ones I’ve seen have left big holes in my understanding. It’s not too technical, though it is the heaviest part of the book and may put one or two people off. It’s followed, though, by the light relief of antigravity, a brilliant subject as it allows all the fringe ideas full rein. All in all, it won’t appeal so much to the readers of really light weight popular science, but if you like your reading with a bit of meat on it, but without the bafflement of those books from physics professors that stray too far into the maths, this is the one for you.